San José, California – January 10, 2012 --- Long before Global Positioning Systems (GPS) or Mapquest, there were travel landmarks. In the days of wagon trains and horseback the early settlers found the way to San José marked by a giant sycamore. Anyone living in or around the Santa Clara Valley will undoubtedly be familiar with the lyrics to Do You Know the Way to San José , a hit song made popular by Dionne Warwick in 1968. The Sentinel Tree, a sycamore on North 21st Street, was that landmark. Three cloned grafts were taken from that Western Sycamore in 2000. On Thursday afternoon (between noon and 2:30 pm), January 19, one of the clones is to be transplanted at History Park at Kelley Park. 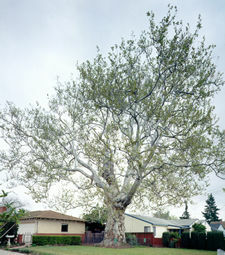 Native to California, the Western Sycamore, or California Sycamore, Platanus racemosa, is common in the Western United States. The Master Gardeners will be moving it from its temporary location to grow and thrive in an open space at History Park, near the Greenwalt House, now home to the Immigrant Resettlement & Cultural Center (IRCC), the Museum of the Boat People & the Republic of Vietnam. History San José is a non-profit organization dedicated to preserving and sharing the continuing history of the Santa Clara Valley. HSJ manages one of the largest and most comprehensive regional history collections in the State of California, from 1784 Spanish governmental records to twenty-first century Silicon Valley technology. History San José aspires to provide innovative national leadership in preserving and sharing regional history by engaging diverse audiences in exploring the varieties of human experience that contributes to the continuing history of San José and the Santa Clara Valley. How is it possible to know this is the oldest tree in San Jose? Just curious. Thanks, Anonymous, for your question about the age of the Sentinel Tree. According to San Jose City Arborist, Ralph Mize, the age of the original tree that was taken down in 2000 may have been approximately 250 years old. Because of the rot inside the tree, it was impossible to use the standard method of counting the rings. His estimate is based upon photos and accounts of travelers arriving in San Jose in the mid-1800's. The sapling that was planted at History Park was a 'clone' or grafting of the original, thanks to the Master Gardeners of Santa Clara County, and its DNA lives on as living history.